Written by Ivana McConnell on April 16, 2017 . This feature is available for accounts on the new Google Cloud infrastructure. Previously, when using delays in your campaigns, you could only know how many people were in that delay— nothing more. 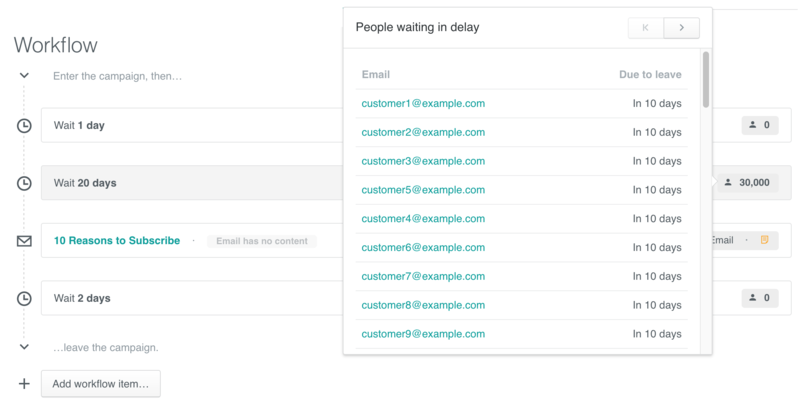 Now, Customer.io gives you more visibility into exactly who is in that delay and when they’re due to leave. For any delay item in the workflow, you can hover over the icon in the label to reveal more info: In the popover, you can see a paginated view of the people currently waiting in the delay, and when they’re due to leave it. If you’d like even more exact detail about leaving time, you can hover over the date and see a timestamp: You can also click the individual user’s email to be taken to their profile page, if you need to. We’re always working to improve visibility and clarity around how people are moving through your campaigns, and ensure you have control where you need it. If you have an idea to supercharge this feature, send us a note to let us know! Questions, feedback, or need a hand? We’re here for you at win@customer.io. !